Health system executives face post-Thanksgiving indigestion as Senate GOP leaders race toward a floor vote on their sweeping tax-cut bill before the end of November. Not-for-profit executives are concerned the Senate bill would hurt hospital capital financing by prohibiting advance re-funding of prior tax-exempt bond issues, which made up about 25% of the municipal tax-exempt bond market in 2017. The House GOP tax bill passed earlier this month goes further, eliminating all tax-exempt municipal bond financing starting next year. That's projected to save the government nearly $40 billion. On the for-profit side, executives worry that both the Senate and House bills would cap corporate interest deductions at 30% of earnings before interest, taxes, depreciation and amortization. That could squeeze companies carrying large debt loads. But by reducing the corporate tax rate from 35% to 20%, the bills could benefit profitable firms. Not-for-profits are also leery of provisions in both bills setting a 20% excise tax on executive compensation topping $1 million and sharply reducing the number of taxpayers who would be able to deduct charitable contributions. They also dislike a Senate provision eliminating the safe harbor for setting executive compensation and approving transactions with insiders. "That would create greater legal exposure for nonprofits and affect hospitals' ability to retain qualified board members," said Jay Gerzog, a healthcare attorney at Sheppard Mullin. Beyond that, healthcare industry groups fear that the Senate bill's repeal of the Affordable Care Act's individual mandate would sharply increase the number of uninsured patients. And they foresee Congress later pushing for big Medicare and Medicaid cuts to reduce the $1.5 trillion bump to the deficit that would result from passage of the tax-cut bill. 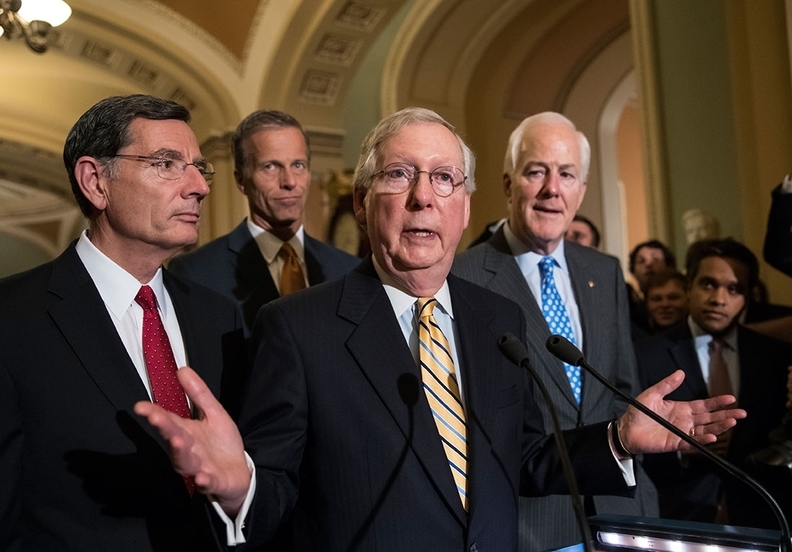 The Senate bill's fate is uncertain, with a number of Republican senators expressing reservations about various aspects of the bill, including repeal of the individual mandate. GOP leaders need the votes of at least 50 of their 52 members, since no Democrats are expected to support it.